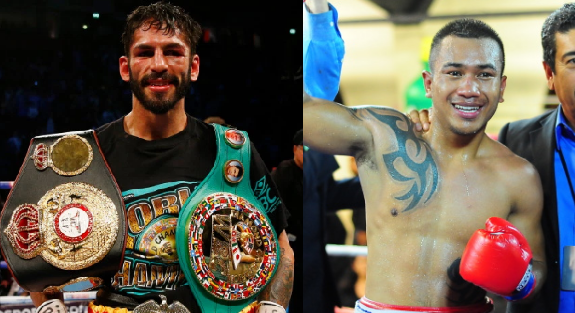 Venezuelan, former WBA World Super Featherweight champion and the current WBA World Lightweight champion Jorge Linares is scheduled to defend his title against the Filipino boxer Mercito Gesta early next year at the Forum, Inglewood, California, USA. Linares has never been defeated as a world lightweight champion since 2014. Linares is a KO artist who has a record of 43W(27KO)-3L. He won his first WBA World Super Featherweight belt against Oscar Larios in 2007 and won his 2nd division world title against Javier Prieto in 2014. Linares is coming off a split decision win over Luke Campbell last September 2017. On the other hand, Mercito Gesta is a 30 years old boxer from Mandaue City, Cebu, Philippines. Has a record of 31W(17KO)-1L-2D. Former world title challenger against Miguel Vazquez in 2012 but lost via unanimous decision. Coming off an 8th round KO win over Martin Honorio last July 2017. Linares vs Mercito Gesta is a co-main event in the Lucas Martin Matthysse vs Tewa Kiram vacant WBA World Welterweight Title fight on January 27, 2018.